Would you rather have a 1-hour flight delay or run an entire 5k with a pebble in your shoe? 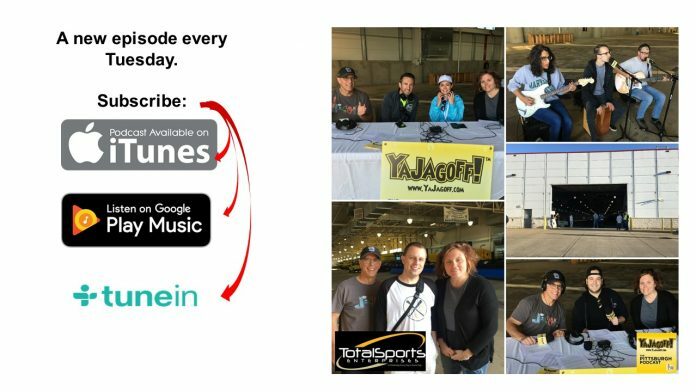 That’s the BIG question that we have all of our guests answer as we record at the Pittsburgh International Airport’s 2nd annual Fly By 5k! We are hanging with Jeremy from Discover the Burgh, Anthony from the Pittsburgher Burger Bash, Troy from the P3R and Alyson Walls of the Pittsburgh Airport. If you don’t see the player bar above in your email, click HERE to listen while you work, rest and play. YaJagoff! Podcast – Show Notes: Episode Music: The trio called Hear Tonight, who will be celebrating the release of their upcoming EP “Chasing the Rain” on October 6th. 01:21 Rachael wants to take one of the airport snowplow trucks home to her 137-foot driveway. And, we talked about parallel vs. perpendicular parking Jagoffs. 04:32 Troy Schooley from P3R .. about producing experiential 5Ks. Can we get a pizza 5k? Alyson Walls of the Pittsburgh International Airport … huge stuff happening at the airport including a greater than 80% increase in direct flights. 13:32 Anthony Renne, from Diana Rua Media is here to invite all of you to come taste AND vote for Pittsburgh’s Best Hamburger at the Twelve Whiskey BBQ Burger Bash & Cocktail Competition 2017. Chef Brian Duffy from Bar Rescue will be on hand. 25:53 Jeremy, from DiscoverTheBurgh.com, is here. He and his wife live in Pittsburgh and write about THEIR quest to post all that the Pittsburgh area has to offer. Everything within a 90-minute drive from the City of Pittsburgh. They have over 320 articles listed so far. 39:51 Evan, Shane, Steven, Nick from the band, Hear Tonight. Make sure you go to their EP release party at the Pittsburgh Hard Rock Café, October 6th. 47:47 Thanks to all of our guests and thanks to Dinnerfor8PGH.com… if you are single and looking to get yourself out in a group of 8 or as a pair, head over to Dinnerfor8PGH.com and get a consultation with Rachael or Nan! Thanks as always to Frank Murgia, Wayne Weil, Intern Hannah not Amanda for everything. * No Longer available IN the Pittsburgh Podcast NetworkChannel Feed.